Autumn can be spectacular anywhere but this year the relatively calm conditions have turned Malhamdale into a treasure trove of visual delights. The best way to enjoy them is at walking pace. On a dry day any time is good for a walk. I like the early morning for tranquillity and the rapid changes in light that invoke a sense of optimism for the day. There are countless possible routes for a short walk, on and off road. The Pennine Way, passing along the bottom of the valley a few dozen yards from Airton Meeting House, offers the perfect rationale for a quick tour of the Aire, either upstream or downstream. Just a couple of miles from its source at Malham Cove, the river is already some twenty feet wide, showing just how significant a role it plays in draining the surrounding hills. As well as the steep slopes of the upper valley, the enthusiastic flow of the river also has much to do with the porosity of the limestone bedrock in the area – and the free draining soils of the hillsides. 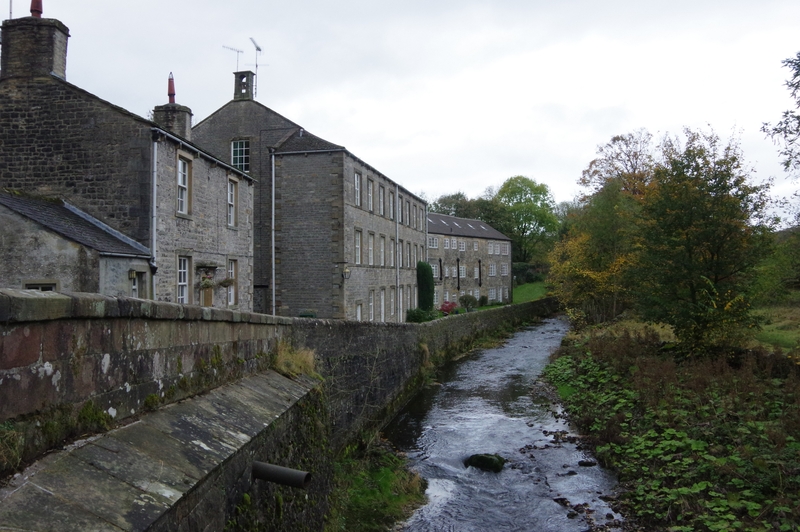 Airton meets the valley bottom in the form of its 18th century mill. Now tastefully converted to apartments without losing any of its imposing character, this building frames the view upstream at what is something of a pinch point in the valley. As much as I enjoy a ramble along the river through the dramatic landscapes around the Malhams, however, my choice today is to head downstream into the more gently rolling if equally intriguing patchwork of fields, rough pasture and copses lying south of Airton. There’s a kind of parkland character to the scene, framed by trees as much as hillsides and with the winding course of the river etching leisurely curves across the landscape before hitting the buffer of Eel Ark Hill, where it abruptly turns to the right. In the distance, the crusty peaks of Flasby Fell peer over the nearby tree tops – a reminder if it were needed that we’re walking through the outlying reaches of the Dales. As the mottled sky begins to brighten, the autumn colours deepen, contrasts growing between trees of different type and stature. My grandmother used to say that she enjoyed seeing the true shapes of trees in winter; but it’s this time of year when the texture of woodlands is at its most apparent, each species turning a different shade of red, yellow, brown or grey and at a different time and pace. I particularly enjoy the flashes of silver along riversides from the massed undersides of ageing poplar leaves. It’s tempting to follow the waymarkers southward but since I’ve no desire to end up in Edale a few days later, I allow my rumbling tummy to remind me this is a pre-breakfast ramble and turn back towards Airton along the road. 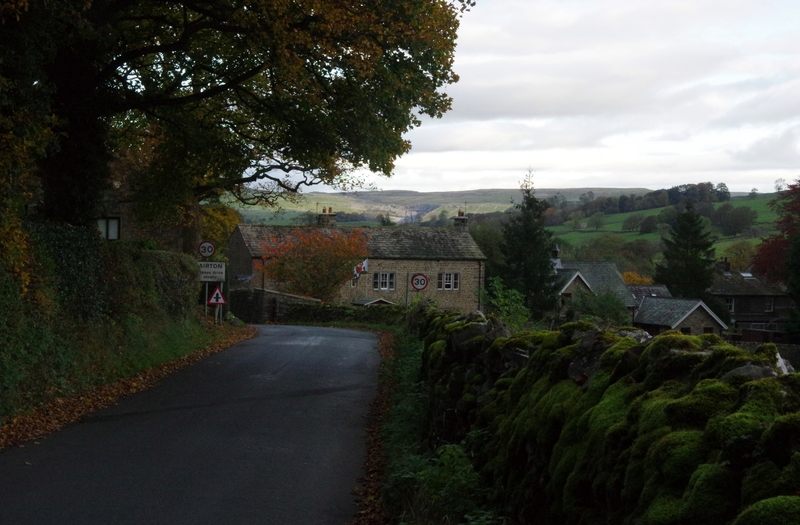 Aside from dodging commuters and farm vehicles on the narrow lane, this is a good choice just for the breathtaking sight of the distant Malham Cove framed between the overhanging trees and the buildings at the southern tip of Airton. In a car and even when cycling, this view appears for a few seconds at most. At walking pace there’s time to drink it in; and as the first direct sunlight of the brightening morning lights up its craggy face I’m reminded again how incredibly lucky I am to be living in this unique landscape. This entry was posted in outdoors. Hello from the new Friend in Residence at Airton Quaker Meeting!